Those of you who work for companies would know that there is a process when it comes to sending or accepting important documents. When one employee receives a major file which contains confidential business information, he or she is going to have to send another document which states the file has been received and that it has been reviewed. The type of document that has to be sent after receiving and going through important business files is what you call an acknowledgement letter. 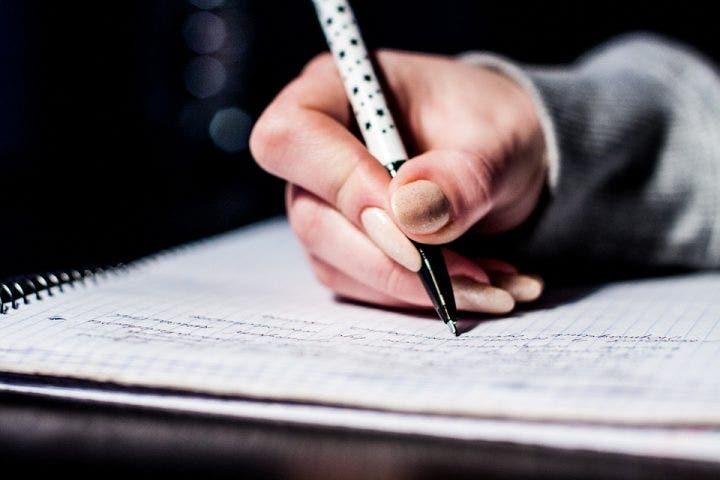 There are tons of acknowledgement letters available and this article will help you learn what they are and how to write them. 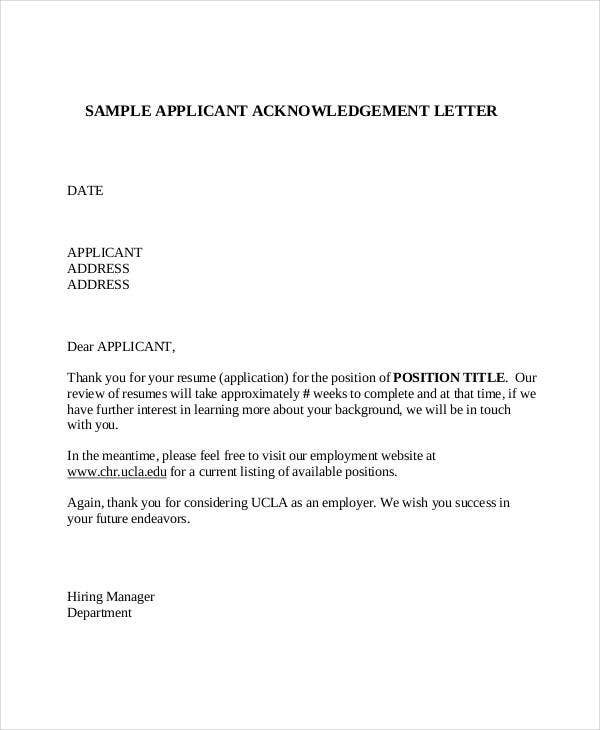 What is an application acknowledgement letter? 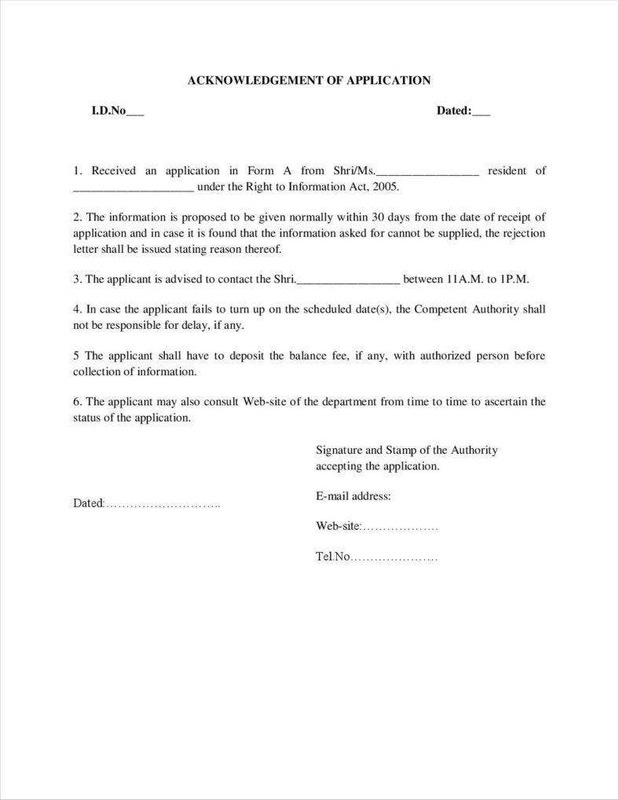 This is a type of letter the sender of an initial application receives from a particular entity that lets him or her know that his or her application has been received and that its contents are being reviewed. 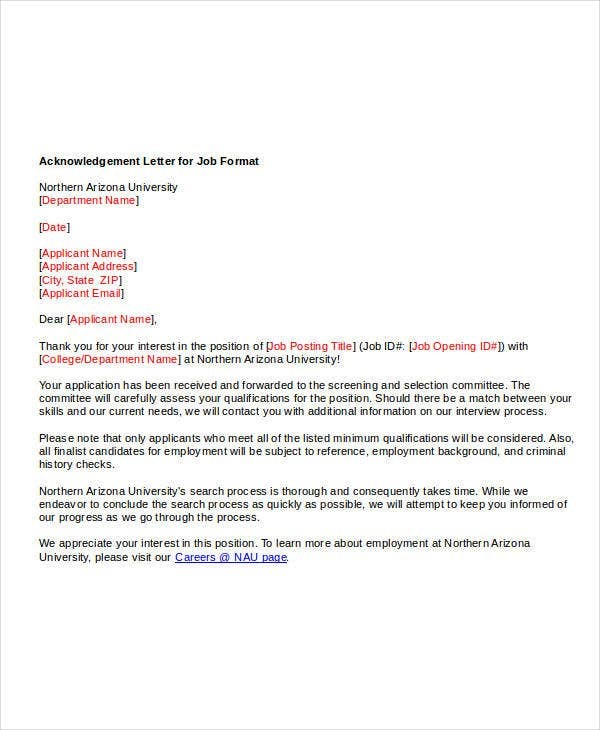 Basically, those who are in charge of going through different forms of applications send these letters to show that a person’s application has been received and reviewed. 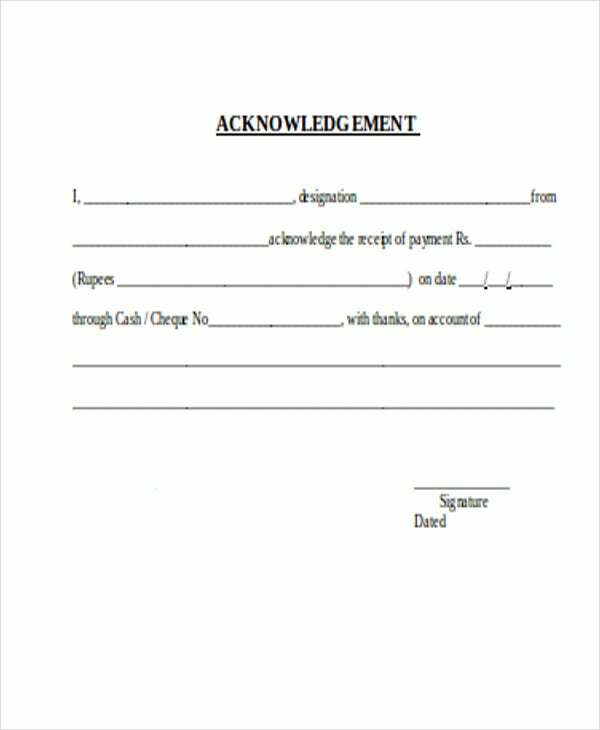 There are different types of application acknowledgement letters and their uses all depend on the nature of the transaction. 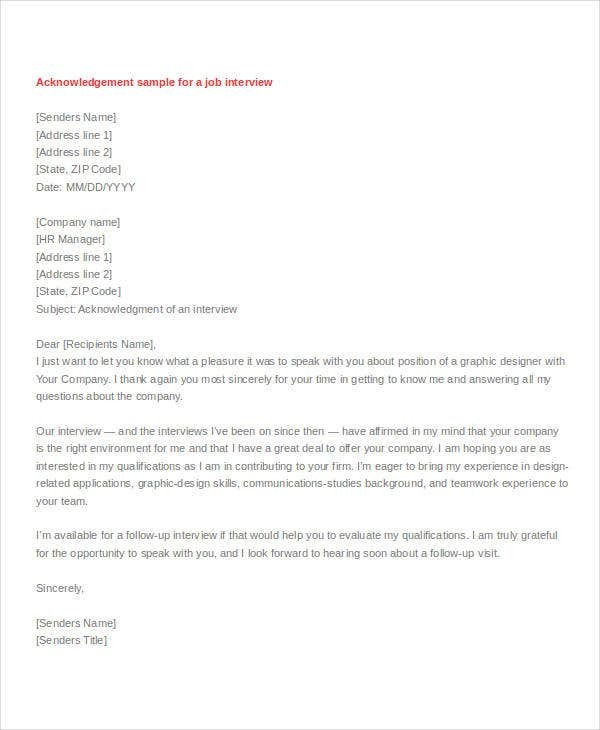 What to include in an application acknowledgement letter? 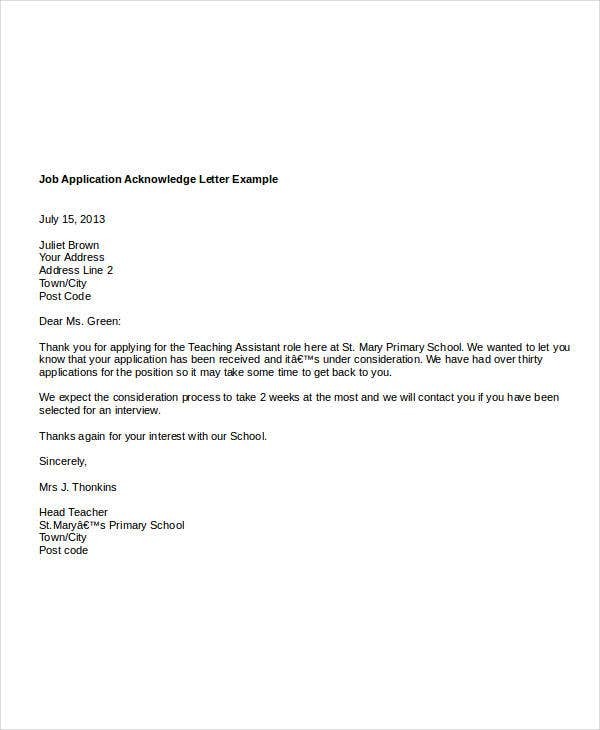 Enumerate the contents of the application letter in the letter so that the applicant knows that the two of you are on the same phase and level of discussion. Just include enough information to tell the applicant that you were able to go through his or her application. Create a statement of receipt. Include the date of when you were able to receive the application. In the event that the results for the sender’s application is already available, then state that in the acknowledgement letter. If there are no results, then you’re going to have to inform the applicant of the soonest possible date of when he or she can expect the results. Grievance application acknowledgement letters. 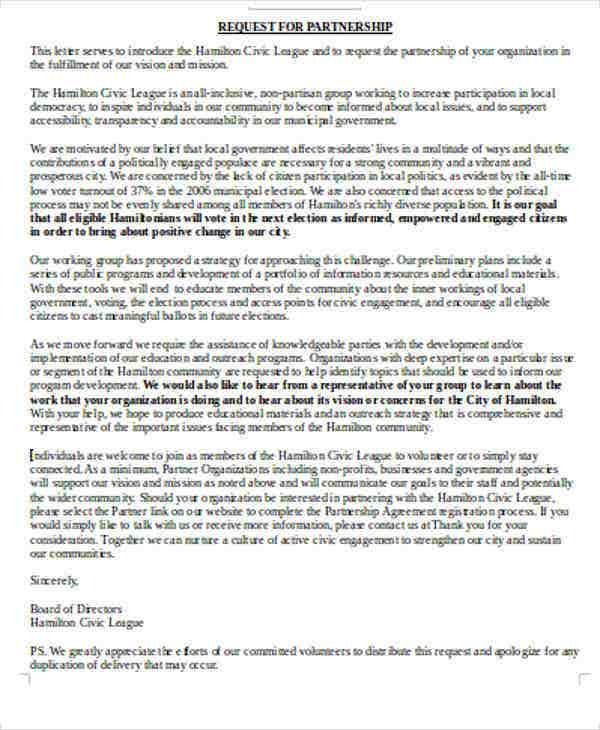 This is a type of letter that is written regarding a complaint that has been passed on to higher management. It’s used to assure the sender of the complaint that the issue has already been looked into. The letter should also state that the proper solution will be formulated depending on the results of the investigation and that the sender of the complaint letter will be notified as soon as possible. Scholarship application acknowledgement letters. 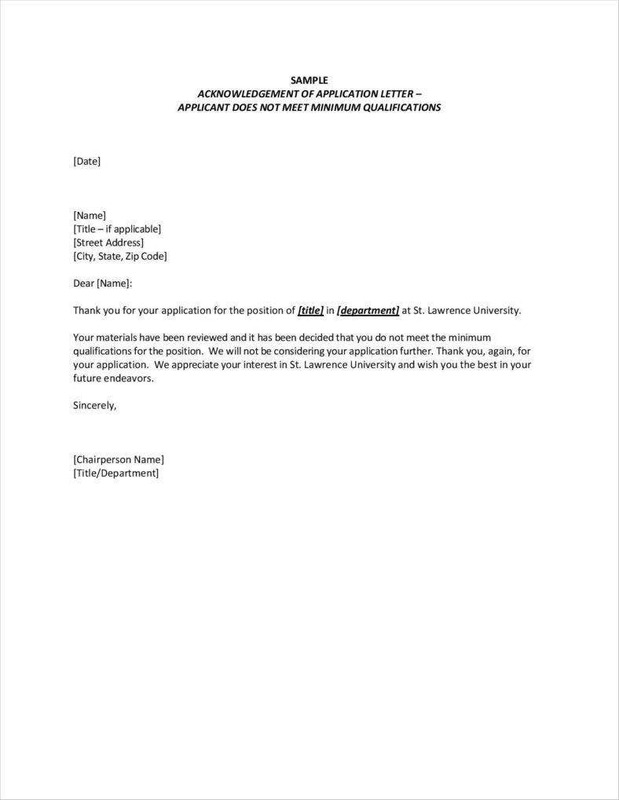 This type of letter is written by the heads of educational institutions for when it is required to tell a student that his or her application for a scholarship grant has been received. This doesn’t just have to come from an academic institution, it can come from just about any government sectors that have educational programs or even nonprofit organizations. These can even come from individuals who have pledged to help specific students in their studies. Visa application acknowledgement letters. This letter is written by the department of immigration to confirm that all the important documents that must be submitted by a person applying for a visa have been received. This letter should also contain information regarding the procedures on how one can process the visa, as well as the expected date of when he or she can expect the results of the visa application. What is a company acknowledgement letter for property? 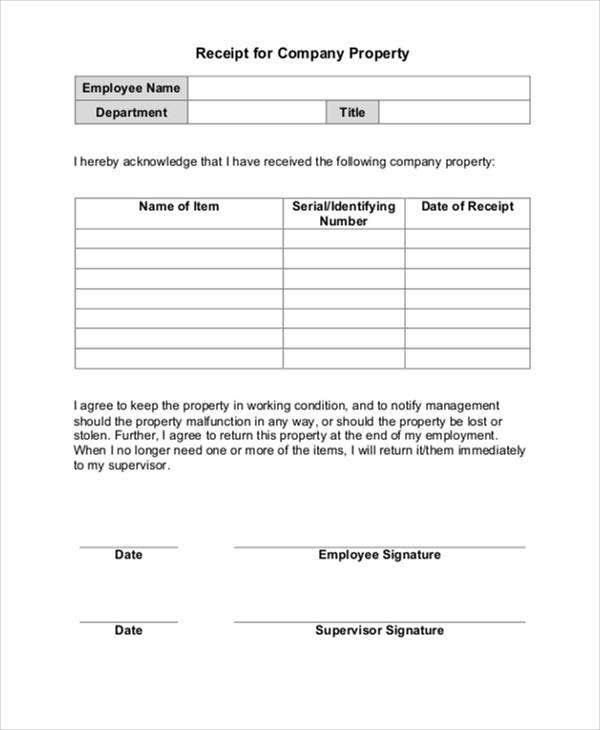 This is the type of document that’s written by an individual to report that he or she has received company property and that he or she was able to go through the procedures required to obtain it. 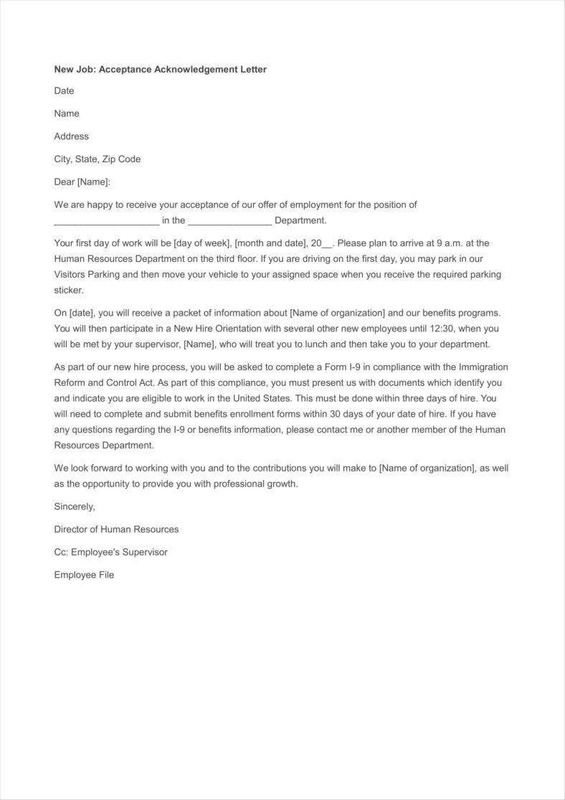 This kind of company acknowledgement letter is very important as it’s basically proof of a transaction that was made between the employee and the employer. This also shows that the two are subjected to the rules and guidelines attached to the letter regarding how the particular property is to be used. What is included in an acknowledgement letter for company property? It ensures that the person who received the company property knows how the items are to be used. This can help guarantee that the person who has received the property only uses it for business-related matters and not for individual gain. This type of letter lets the receiver know that the items he or she has received will remain as company property even if he or she is tasked to take care of it. This also ensures that the receiver practices proper usage of the item to ensure that it will not get damaged. It lists down all of the items that were received to ensure that all of them are still in good working condition. It helps the company know that the sender is aware of the terms of consequence should any of the company property be either damaged or lost. You have to go over all of the contents within your acknowledgement letter and make sure that all of the information is accurate. The reason for this is because it may just be used for future reference for company-related matters. State the condition in which you received the items. This will help prevent any issues regarding how the property was handled as there may have been scratches or malfunctions even before the property was lent to you. You’re going to have to be aware of the terms and conditions regarding the usage of the property that you have received. The reason for this is because you have to follow the rules and regulations when it comes to handling the items that you have received. A training acknowledgement letter is a document that states all of the items that were part of a particular training session. This also assures the person who receives this letter that a specific person who attended the training session has completed all of the programs that he or she was tasked to take. So this kind of letter is very useful for employers that need to know whether their employees were able to take part in and complete the training session they were required to attend. What is a safety training acknowledgment letter? Just about every business requires employees, and anyone else who’s directly involved in business activities, to attend safety training programs. The reason for this is to guarantee that these people know what to do as well in situations that could endanger their safety. With the help of safety training acknowledgement letters, it assures the business that their employees have attended the required safety training, as well as learned all of the safety knowledge and procedures that they need to know. Basically, this acts like a safety report for employers. What is included in a safety training acknowledgement letter? 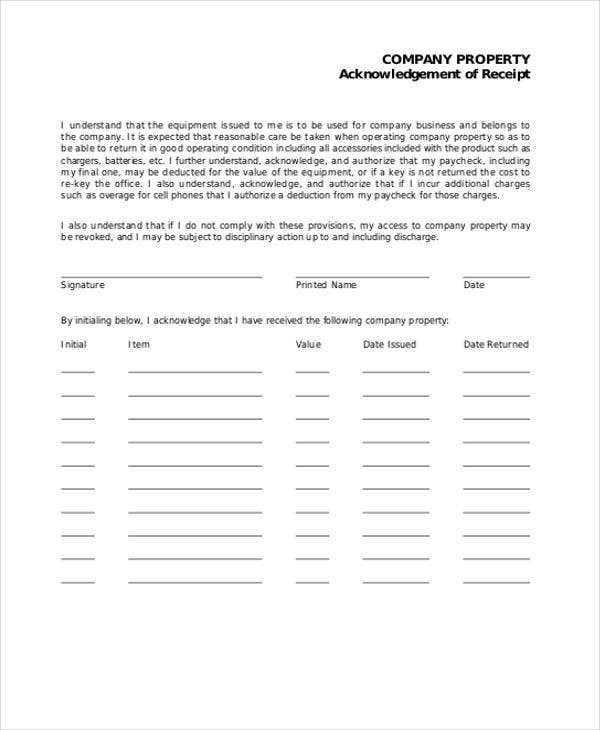 This is the type of document that’s made by either a business or individual on the receiving end of the transaction to show that they were able to receive the offer, complaint, appeal, or request that was provided by the other party involved in the transaction. So what this letter basically does is assure one party involved in the transaction that the items have been received by the other party who wrote the receipt acknowledgement letter. What should be in a receipt acknowledgement letter? One of the main reasons why you need to create this document is that it assures the other party involved in the transaction that you were able to receive whatever item was delivered to you. This letter can be used as evidence of who was able to receive a particular item and when it was received. It is a formal way of closing a transaction should there no longer be any concerns regarding the particular item or items that were received by one member of the party involved in the transaction. So should you feel that there are no more questions or things that need to be clarified regarding whatever was sent to you, then having a copy of this letter will serve as proof that a transaction between you and another party has been finalized. It’s a letter that allows you to handle transactions in both a formal and professional manner. This is also very helpful in relaying information on how the transaction came to be. So when there are certain situations wherein information regarding a particular transaction is required, then all you have to do is pull out this letter and use it as physical evidence. 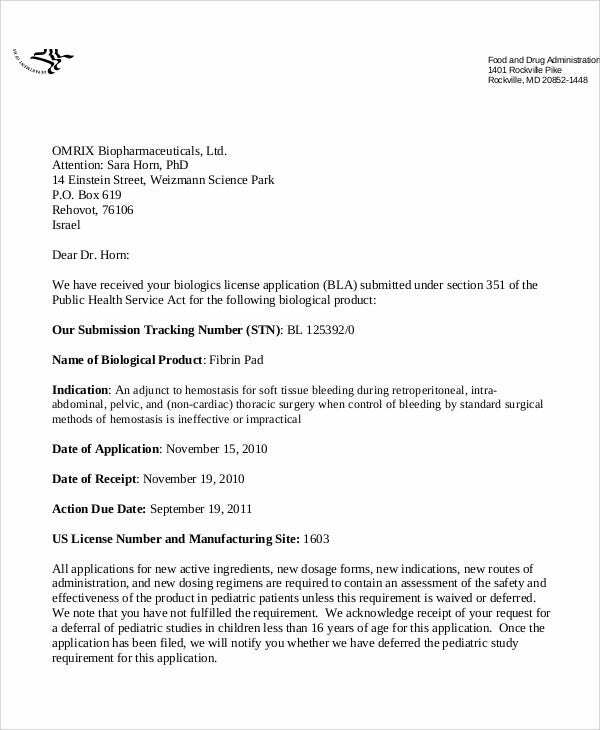 Document and product receipt acknowledgment letter. 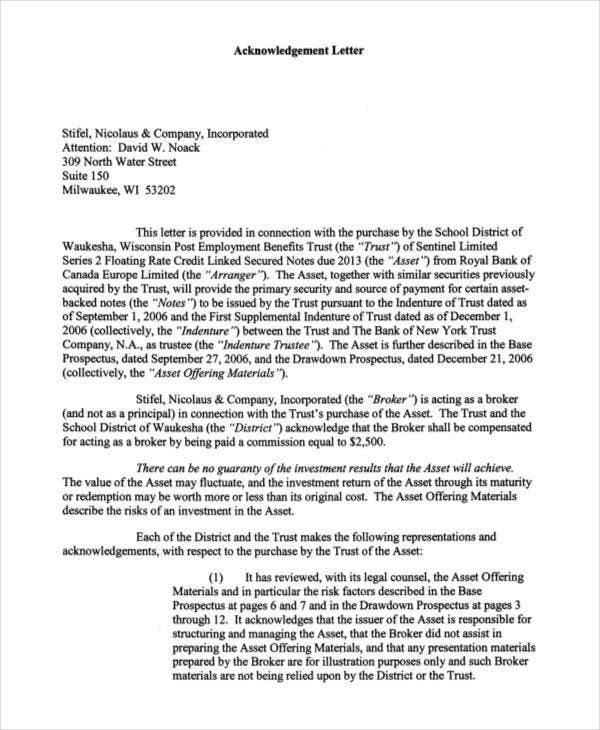 This kind of letter basically confirms that all of the important documents for the transaction have been properly signed, as well as confirms that all of the item/items stated in the document have been properly received. Application receipt acknowledgement letter. This is usually handed out by a business or an individual who was able to receive someone’s application form for a lease, job, or even volunteer participation. This basically tells that individual that his or her application is being reviewed and that he or she will be contacted at the soonest time possible when the results of the application review have been finalized. Payment receipt acknowledgement letter. This is made during business transactions and processes wherein it provides information regarding the monetary aspect of whatever product was purchased or service that was provided. Companies benefit greatly from this type of letter as it helps them with making expense reports to ensure that they have taken every single payment that was made with company funds and listed those down. Property receipt acknowledgement letter. 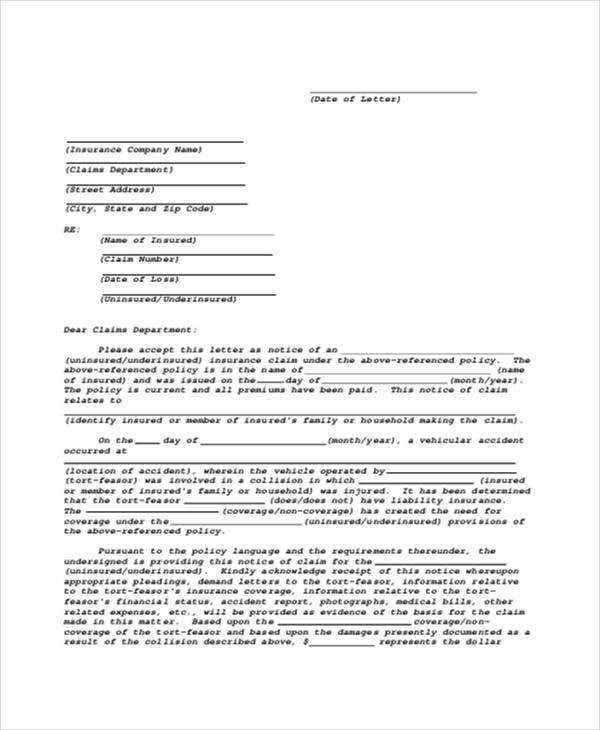 This kind of document is usually sent by the caretaker or the owner of a particular type of property. With it, the recipient is told that his or her requests regarding activities that need to be done in a particular property, such as maintenance or inspection, has already been accepted. So this basically helps you out in certain situations involving property such as knowing whether your landlord was able to receive and adhere to your request for maintaining the room that you have rented. 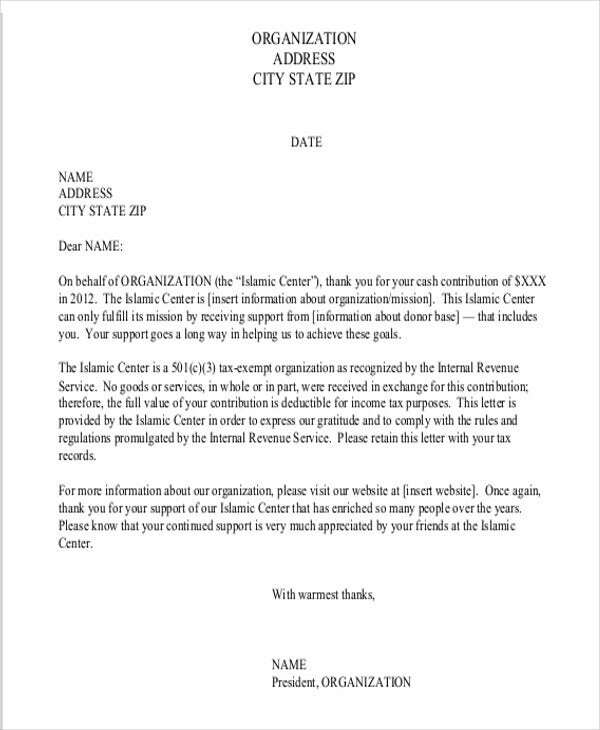 Offer receipt acknowledgment letter. This letter is able to show and confirm that the person is aware of the offer that’s being made by another party. This also shows the decision of the sender regarding his or her thoughts about the offer. 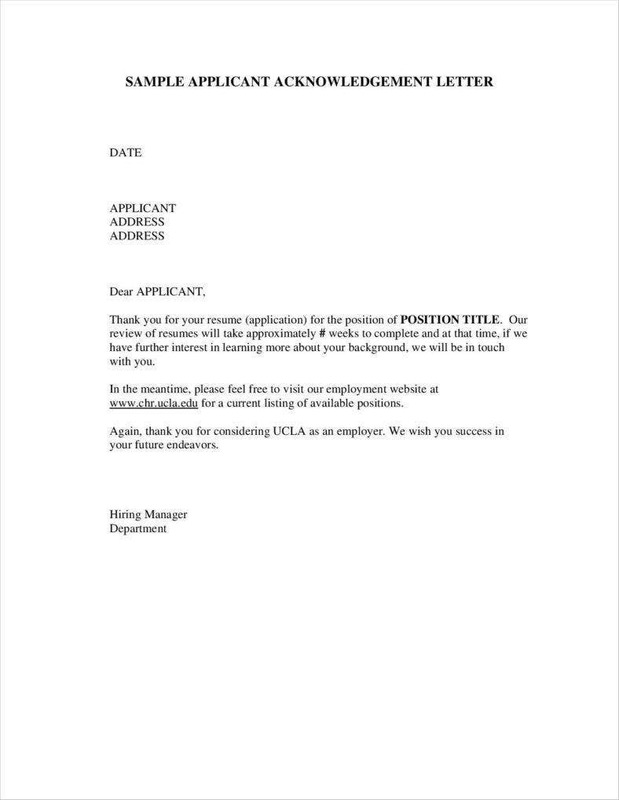 So whether you’re interested in the offer or if you think there are much better opportunities that you can take, you’re going to have to write down your decision in this type of acknowledgement letter. There will always be a time when a company experiences the loss of an employee due to resignation. There are a number of reasons why an employee would want to leave the company that he or she is working for. However, no matter what the reason may be, it’s your job as the employer or manager to handle the procedures regarding an employee’s decision to leave. This is why you’re going to have to learn how to write a resignation acknowledgement letter. With this letter, you’ll be able to show the employee that you have received his or her resignation letter, as well as show that you were able to thoroughly go through its contents and understand it. 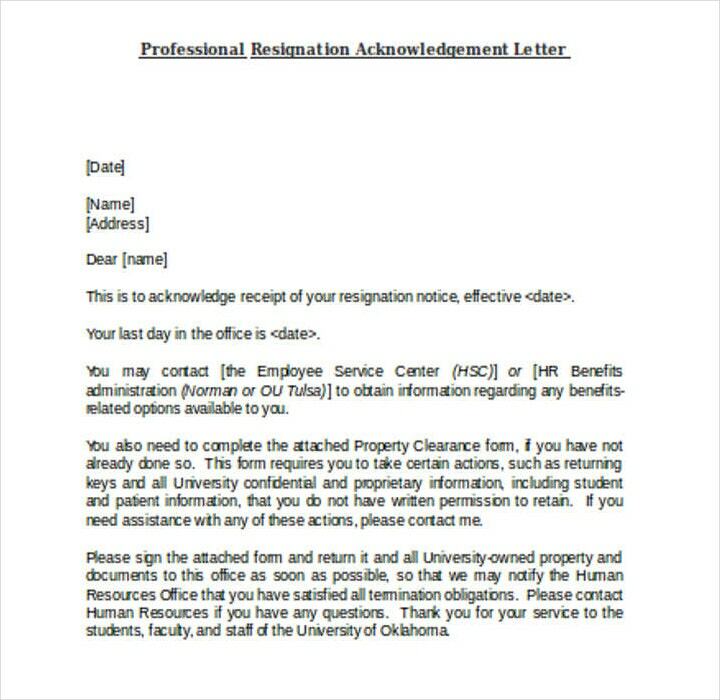 Just about every person in charge of management has to learn how to write these letters as learning how to deal with an employee’s resignation professionally will only help your company leave a good lasting impression on a departing employee. 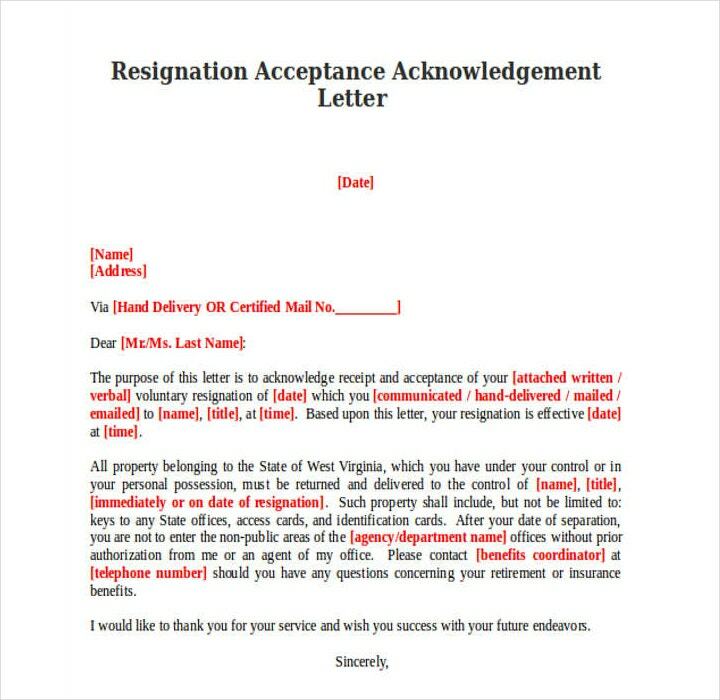 Let’s suppose that you have received a letter of resignation from one of your employees. What you’re going to have to do next is to send your response through the form of a resignation acknowledgement letter. With it, you can ensure the employee that you were able to receive his or her resignation letter and assure him or her that you’re going to read it. So here are the tips that can help you write a resignation acknowledgement letter that will leave a memorable and professional impression of you and your business on the resigning employee. When writing the letter, be sure to make use of a business letter format. 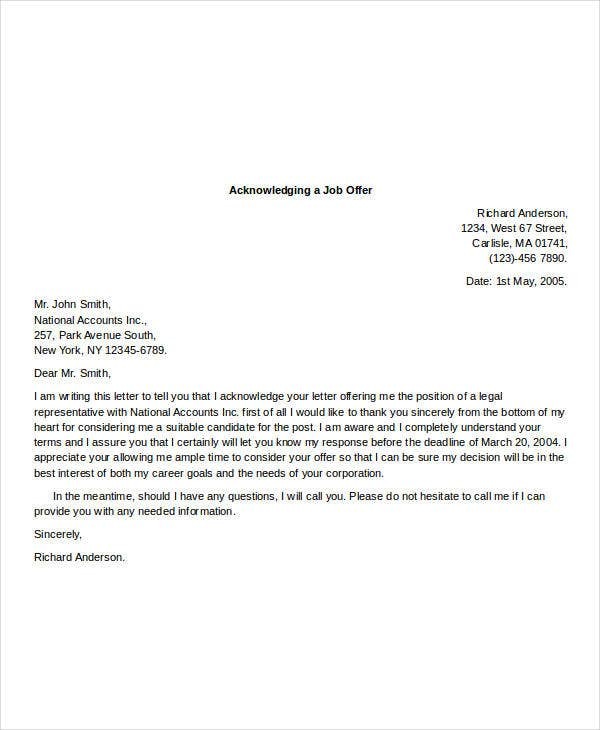 You’ll want your letter to look as professional as possible so that your employer knows that you’re taking the resignation seriously. 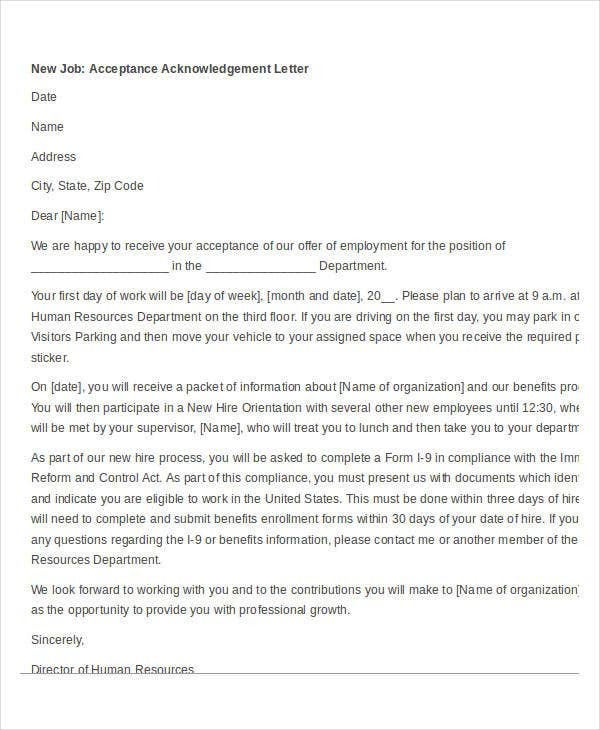 So what you’re going to have to do first is to provide the employee’s contact information at the top left corner of the letter followed by your own contact details. Then you must place your signature on the bottom-most portion of the letter, with your complete name right below it. 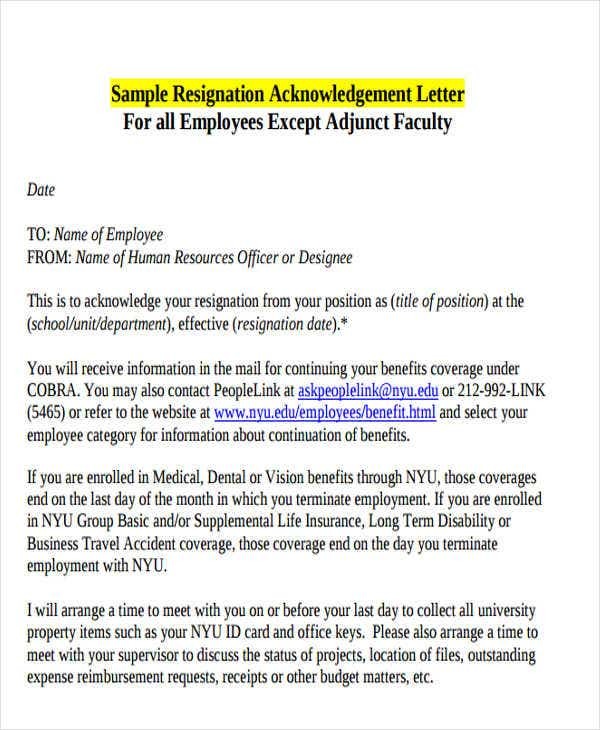 Show the employee that you were able to both receive and accept his or her resignation letter. This information must be written within the body of the letter as you’ll want to explain this clearly to the employee. 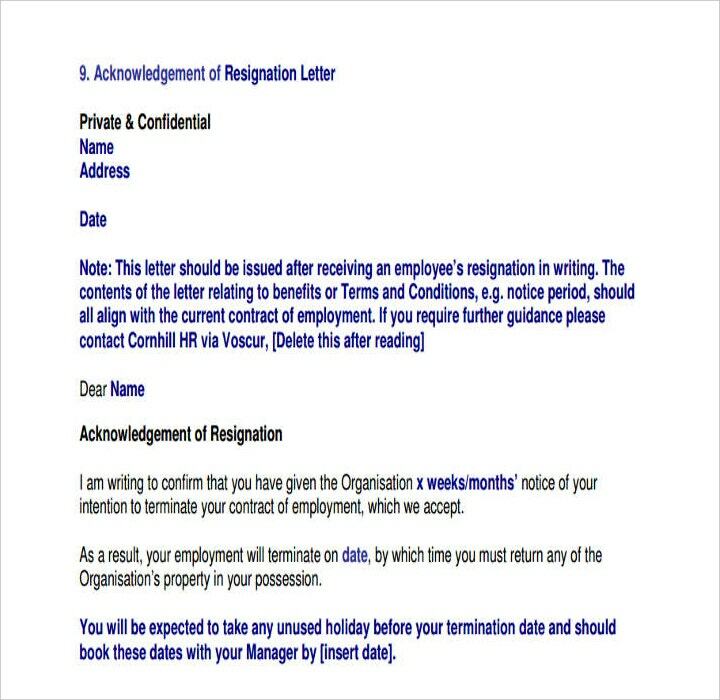 You have to state that you were able to receive the letter, go over all of the information it contains and that you have accepted the employee’s decision to part ways with you and your company. Next is that you’re going to have to write down the date of the employee’s final day of employment. 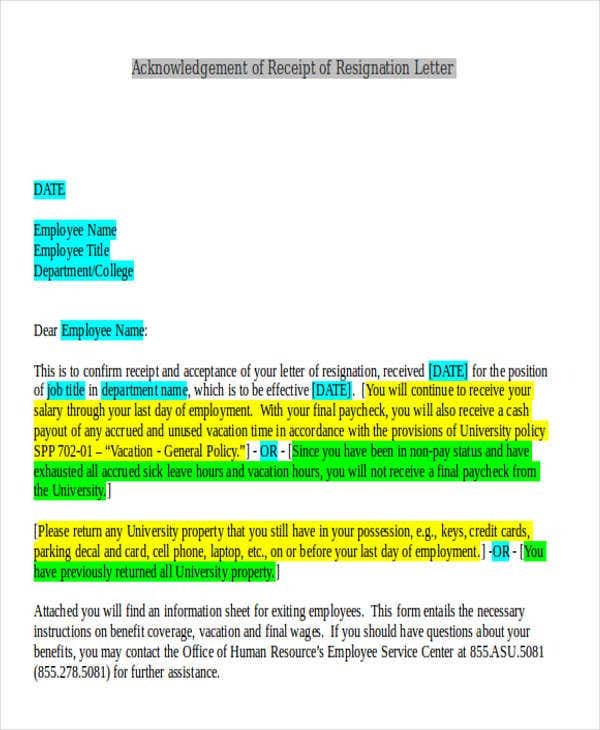 Not only is it important that all of this information is clearly written, you also have to guarantee that all of the information is accurate as it’s all going to be part of the employee’s records. You should be able to express with your resignation acknowledgement letter that you understand the employee’s reason for leaving your company. Although it’s never a good thing to have an employee leave, especially if it’s one who was very valuable to the business, you won’t have much of a choice but to accept that he or she is leaving to find other ventures, or if certain reasons prevent him or her from continuing to work with you and your company. 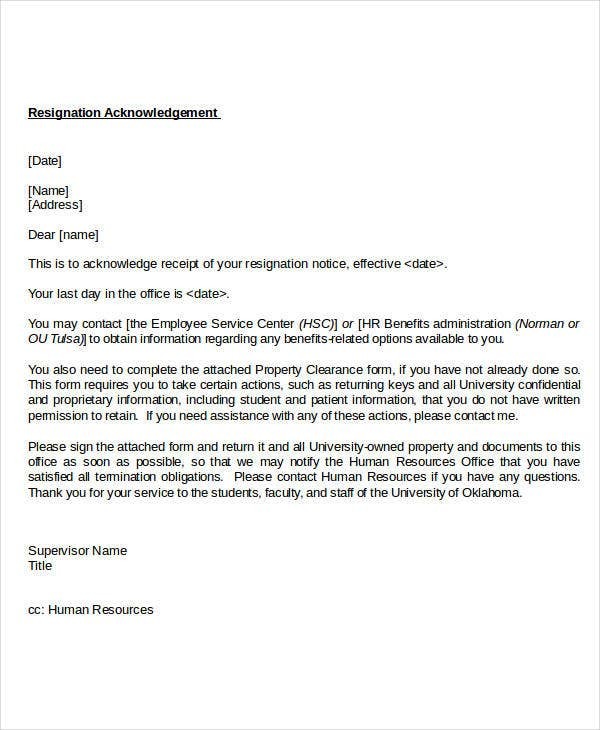 So when you’re writing the acknowledgement letter, you’re going to have to indicate that you regret the loss, but that you also accept the employee’s reasons and decided to leave. Doing so will tell your employee that there is no bad blood between the two of you and help show that you’re able to handle the matter properly. After you have finalized everything that needs to go into your resignation acknowledgement letter, make sure that you keep a copy of it before you decide to send it to the employee. You need to do this because there might come a time when you’ll need to pull out this information during situations that require them. A good example would be if the resigning employee decides to come back and wishes to work for you and your company again. 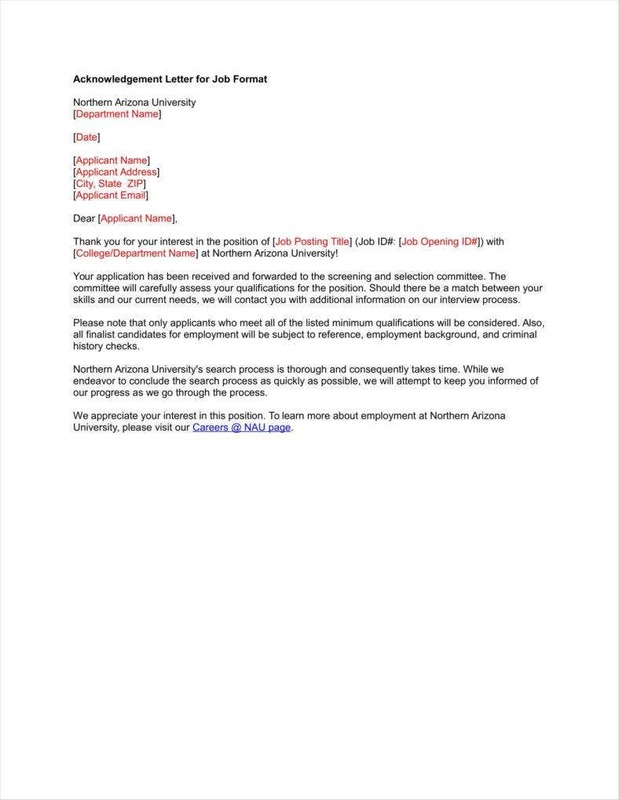 Pulling out this letter will help you make the important decision as to whether or not the employee is worth hiring again. So you can either keep this letter in your personal file or you can hand it over to Human Resources. 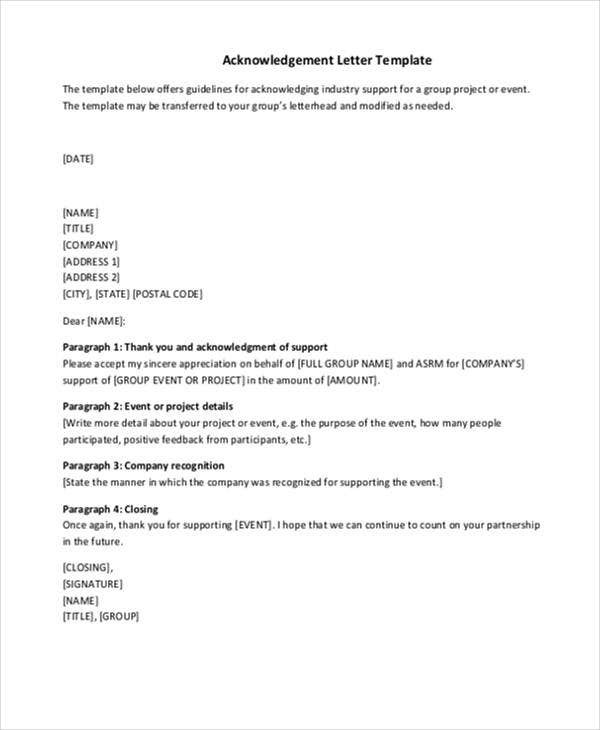 If you would like to learn more about acknowledgement letters and how you’re going to write them, then you can go through any of our available articles. They may just provide you with the information that you need to help you write the acknowledgement letter that you desire.